At Phoenix International School Early Years department, we aim to provide all our children with an exciting start to their education in a setting which cares, guides, stimulates and supports everyone in our school community. We provide the highest standards of quality child care underpinned by our strong commitment to family values and our “home from home” philosophy so that children feel safe and secure and loved whilst parents are away. Our staff are dedicated to encouraging all children to achieve the very best they can in all aspects of their lives. Phoenix International School Early Years department enhances children’s natural thirst for knowledge by providing a range of varied activities in short bursts which facilitates learning through play. During the day, your children will have opportunities to ride tricycles, build castles, climb, play catch, paint pictures, dress up, squish clay, sand and soap between their fingers, listen to stories and sing their hearts out. But there is more to their play than meets the eye. Through carefully and thoughtfully designed activities, children are learning positive social behaviours, developing large and small motor control and problem-solving skills, and practising good eating habits, cleanliness, safety, and much, much more. A Unique Child – At Phoenix International School we recognise that every child is a competent learner and we endeavour to support children in becoming resilient, capable, confident and self-assured. We value the diversity of individuals and recognise that children develop in individual ways and at varying rates. Enabling Environments – Phoenix International School recognises that the environment plays a key role in supporting and extending children’s development. Learning areas are organised to allow children to explore and learn, and to locate equipment and resources independently. There is an enclosed outdoor area, which has a positive effect on children’s development. It offers children opportunities to explore, use their senses and be physically active and exuberant. Positive Relationships – We recognise children learn to be strong and independent from secure relationships. We aim to develop caring, respectful, professional relationships with children and their families. We recognise the role that parents have played, and their future role, in educating their children and value the contribution they make. Learning and Development – This is divided into the 6 main areas as shown. We value all areas of learning and development equally because we understand that they are inter-connected. We offer learning through play-based, fun experiences and study various topics on a monthly rotation. In this way, children have the opportunity to think creatively alongside other children as well as on their own. They actively communicate with each other as they investigate and solve problems. Children’s learning and development is assessed by their progress in achieving the Early Learning Goals. Our timetable provides plenty of opportunities to learn whilst having fun. 09.30: Focus activity related to monthly topic. Whilst we have a huge range of resources at our disposal, at Phoenix International School, we believe our biggest asset is our staff team. We invest time hand picking the best professional carers to look after your children, all of whom are qualified early years teachers and nursery nurses. We value our staff team very highly and all personnel are given every opportunity to develop their personal and professional skills and to broaden their knowledge of childcare practice. We hold regular staff meetings, encourage our team to attend internal and external training courses and to keep abreast of developments in their field. We keep a record of achievement for each child. Staff and parents working together on their children’s records of achievement is one of the ways in which the early years department and parents work in partnership. Your child’s record of achievement helps us to celebrate together their successes and to work together to provide what your child needs for their well-being and to make progress. In order for us to maintain this record we will collect information about your child’s needs, activities, interests and achievements. This information will enable the staff team to identify your child’s stage of progress. You can add to this record of achievement by providing copies of any certificates, photos of any medals or cups they have won, or any other little achievements your child may have made. As parents you are the first educators of your children. We believe in a close partnership with parents and staff as we join you in educating your child. We want to work closely with you. Good communication between staff and parents enables us to inform each other of relevant matters concerning your child. We appreciate being informed of any change at home that might affect your child and will treat anything you tell us in strict confidence. We communicate informally with families at the end and the beginning of each day when children are dropped off and collected. Children will be provided with a home school diary which acts as a vehicle for two-way communication between us. We have a folder which holds all the Early Years learning goals that your child has achieved. We also have an Art folder in which we collect children´s artwork so that you can take it home at the end of the year. We also hold parents’ evenings once a year when you will be invited to discuss your child’s progress. However, there is no need to wait for these if you have questions or concerns. We want you to feel welcome and will always have time for you. Parents who wish to be fully involved in their children’s day and who may have time to spare can offer to take part in a session by sharing their interests and skills with the children as a parent volunteer for example gardening, knitting, woodwork or helping out with school trips and visits. 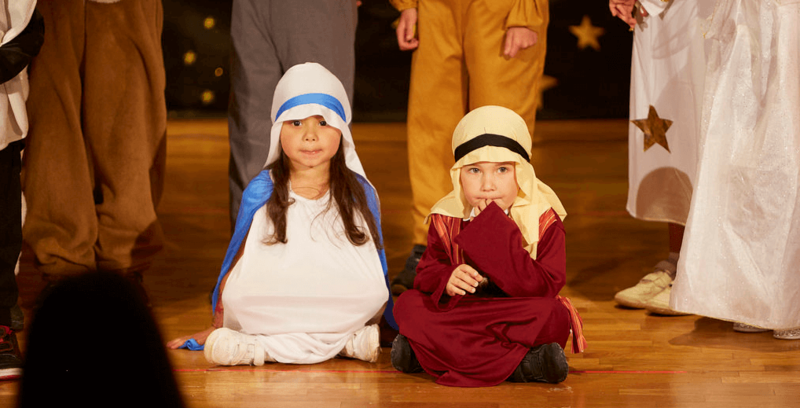 We will be offering a variety of drop in sessions, dress up days and we regularly hold plays, parties, awards ceremonies to name but a few events. Early Years is open Monday to Friday from 9.00 to 4.00pm in term time. Lunch is at 12.40. We have a restaurant downstairs where you can order a hot lunch for your child, or you can provide a packed lunch. Owing to the hot weather in Spain combined with energetic activity, please provide plenty of your child’s favourite fluids and snacks to keep them hydrated and energised throughout the day. School uniform in worn from Reception age onwards. Please see the attached list for details. For preschool children, please ensure that they come dressed in comfortable clothing which will enable them to fully enjoy themselves without worrying about keeping clean. A sun hat and a named bottle of sun cream are essential during the hot weather. Flip flops and crocks are not allowed at school as they are not safe to run around in. We would ask that all items of clothing are clearly labelled with your child’s name. If your child is just learning to use the toilet, please provide a spare pair of clothes and some wet wipes just in case of accidents or spillages. At the end of a session, we will hand your child over to an adult whom you have authorised to collect your child. Any changes to these arrangements should be communicated to the office at the earliest opportunity. Young children learn best when they are actively involved in investigating and exploring. They need to touch, to feel and to experiment with different materials to find out what they do and how they work. They learn most when they are involved in their play and when a member of staff can be near to talk to them about what they are doing and help to extend their thinking. We consider it very important that the children should be as self-sufficient as possible. This means that when the children ask for help we show them how to do things for themselves rather than doing it for them. In summary you can see that we strive to provide the highest standards of quality child care underpinned by our strong family values and our “home away from home” philosophy. We wish to form a partnership with all of the important adults in your child’s life to ensure we provide the best care and attention for your child at all times. Our staff team are our biggest asset and will nurture your child in a warm, caring and stimulating environment whilst adhering to best practice in safety and security.